It is one of the most unusual memorials on any Civil War commemorative landscape North or South. I vividly recall my own loss for words during my first trip to Mount Auburn Cemetery in 2011. It is a stop at the top of my list for next year’s Civil War Memory class and thanks to Joy M. Giguere’s essay in the March 2013 issue of The Journal of the Civil War Era I now have a bit more interpretive ammo under my belt. There is quite a bit more to consider in this article, especially the contrast between Bigelow’s sympathetic prewar stance on slavery and his eventual position against the “peculiar institution” that was shaped by the war itself. 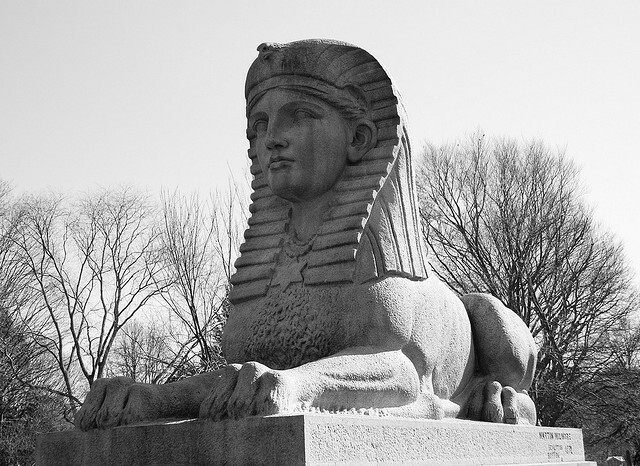 The article also contains an excellent overview of the influence of the Egyptian Revival movement on American culture. One of the things that I hope to emphasize with my students next year is that crucial distinction between race and slavery that is so difficult to crack. I found your blog via Mount Auburn Cemetery on Facebook – thank you for not only taking an interest in my article, but also saying such nice things about it. I’m glad it will be useful to you in your class! Nice to hear from you and thanks again for such a thoughtful essay. As a member of the 54th MA Volunteer Regiment re-enactors, I found this fascinating. I was made aware by a tour of the Mt Auburn cemetery broadcast on PBS Boston. I will definitely visit this site. The 54th has participated in the Cambridge Memorial Day Parade annually. Glad to hear you found this helpful. It’s indeed a fascinating monument. Thanks for stopping by.